You must make reservations at least 5 minutes in advance of the time at CK Restaurant. Neighborhood locale with rustic accents serving New American lunch & dinner plus weekend brunch. Restaurant was half empty on a Sunday brunch, however there was only three people working in entire restaurant. Two servers and one chef. Service was painfully slow. It took a while to get seated even though we had a reservation, because the servers were buzzing tables which was ok. But it took the servers 20 minutes after we sat to great us while they noticeably kept away from eye contact. The bar was half full of used dishes and dirty glasses. Then they tell us all drinks are made with wine juice, there is no liquor. We left. Sunday brunch; Food was great but the regular coffee not great and the hot chocolate was overflowing and making a mess, service not so great, waiter seemed overwhelmed even though the place was barely half-full. Music was great (80’s), but way too loud for anyone’s taste for brunch music, got turned down later, luckily. Overall ok, but not great. We came for an early dinner, so the hostess was amused that I made reservations. Regardless, I hate long waits, so I always think it safer to make a reservation. I've been to CK once before, but that was for brunch. I was impressed with the food, so thought it was time to try dinner. The food was impressive and beautifully displayed. We started out with salads. The Caesar salad was average. I only order it because it had anchovies, but it wasn't anything special. I wish I had what my daughter ordered: the beet and farro salad. It large enough to split. She raved about it. 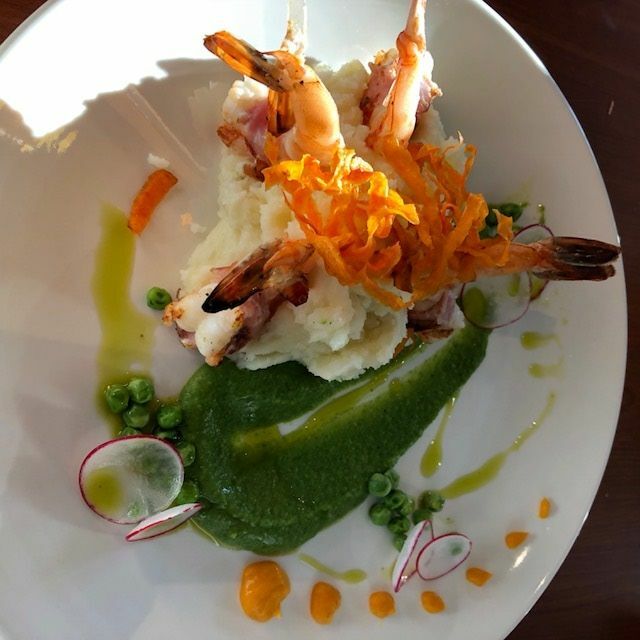 I had the prosciutto wrapped prawns over mashed potatoes with peas and a pea puree, as well as a carrot puree. Beautiful and very tasty. My daughter had the salmon with a pureed cauliflower, I believe. She practically licked her plate clean. My husband had the grilled prawns, probably the least impressive of the three, although still delicious. He thought it was too rich. For dessert (of course! 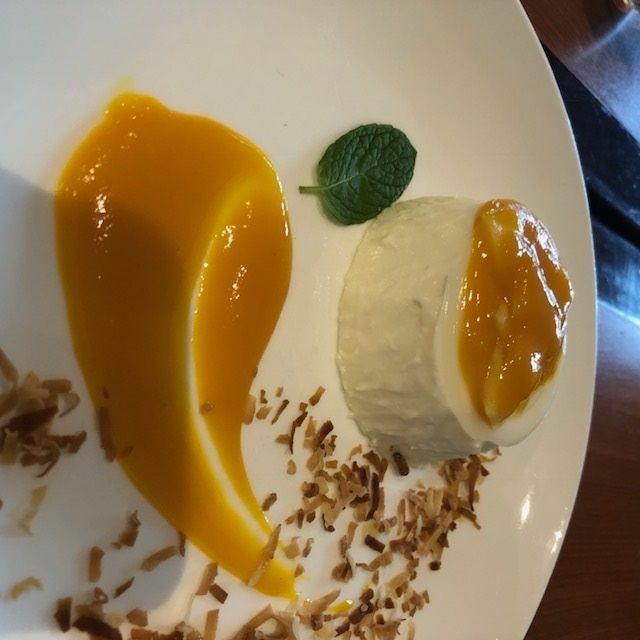 ), we had the mango panna-cotta. Delicious! If it's rich, it's deceiving. It tasted so light. Let me live with my fantasy! I'd order it again. CK is one of the nicer restaurants in town. It makes a great date night dinner, but also a friendly neighborhood place, especially with the bar. I hope to visit again soon! Had to wait far too long for a cup of tea. It arrived once all the food was cooked. Food tasted very good and was nutritious as well. The slow tea was a big deal to me; the wait was just too long. Did not have menu items in stock. Did not cook food fresh. Incompetent service. Webster Street is "coming into its own" as fine restaurants and businesses move in. CK is a great example. The food is incredible, and while the wait staff was overburdened when we were there, everyone was very pleasant and working very hard for all of the customers. You must go if you haven't been there yet! The Impossible Burger is heavenly. The inside-out wagyu oaxaca burger was soooo tasty! It looked small at first but it was very filling. The cheese was the perfect amount of melty. We shared the brussel sprouts and it was a huge serving but we devoured it. I was disappointed that I got too full to finish my fries because they were great too, greatly salty and crispy (I usually don't finish fries anywhere). Definitely one of the very best in Alameda. Sophisticated flavors, great service and fair price. Well done! Great little neighborhood restaurant. Food was good but need more seasoning. Great selection of vegetarian food. The restaurant location is tough. They are on Webster street but for whatever reason this spot can't get traction. The space has changed users several times. This restaurant is trying hard and desires to make it. The food is good, the service is good. I have been there three times and like what I order and have a good time whenever I have been there. Food, service and value were great. Acoustics in the restaurant are odd, though — not the restaurant's fault, but there was a table of drunk business people being pretty loud, and it carried across the entire dining room. We dined at CK with two other couples. We all very much enjoyed the restaurant and the food! The wait staff allowed us as much time as we needed to talk and catch up before ordering and we appreciated this very much. Once our orders were taken, the food arrived in a reasonable amount of time (but not too fast) and first we noticed that the presentation of all of the entrees was lovely as was the taste and quality of the dishes. Ample portions and very good service rounded out the evening. Only one complaint: We didn't notice a statement on the menu that they charged an automatic 18% gratuity for parties of 6 or more, so in splitting the check three ways, we each added a 20% tip to our individual bills. After arriving home, we noticed that the receipt indicated the 18% gratuity charge - so the staff got very nice tips that night on our party, which is fine. It would have been nice for them to point out that the gratuity was already included as none of us noticed this fact on the bill at the end of the evening. We will go back, overall very good experience! I’ve heard really good reviews from friends. However, I was not happy with my meal. The prawns were very very dry, the pasta was dry. Sent back, reordered beer battered fish which was undercooked. The Panna Cotta was good. The waitstaff was pleasant. If friends ask, I would let them know I didn’t have a good experience but understand others have. I hope you do well, my intent is not to hamper. We had a lovely family dinner at CK Restaurant before a show in Oakland on Saturday night. We had the Roasted Bone Marrow with bacon jam and Steamed Mussels for appetizers. The Bone Marrow was rich, and a little fatty, but incredibly delicious. And the Steamed Mussels in the coconut curry broth was perfect. The curry broth was mopped up quickly with our breads. We also had the burger, grilled prawns with fettucine and the risotto -- all were yummy. I was very impressed with CK Restaurant inside beautiful layout upscale. The waiter was awesome and the food was like a picture on the plate delicious good food. I will be coming back. Meh. Pork bites were great. Cesar salad was bleh. Dressing was watery and flavorless. Needed salt, to be honest. Romain leaves were stacked high on the plate which looks nice, but once you start to cut the leaves, it’s impossible to keep it on the small plate. Not many people there. Typical Alameda crowd: poorly dressed and wearing flip flops. Need to try it for dinner. Brunch can be a challenge. CK Restaurant was a wonderful discovery for our family. My son, whose birthday we were celebrating, selected CK based on its positive Yelp reviews. The service was very, very good. The food, which was beautifully presented, arrived at our table quickly and we were surprised by the large portions, as well as the excellent prices. Two of us ordered the Grilled Pawns in creamy white wine sauce and fettuccini; one of us ordered the Inside Out Wagyu Oaxaca Burger; and one of us ordered the pan seared Skin-on Salmon. Additionally, we ordered the Caesar Salad with shaved parmesan, anchovies, and a parmesan cracker; the roasted Brussels sprouts; and the Calamari with zucchini, fennel, Fresno chiles, lemon, and chipotle aioli. EVERYTHING was delicious! The restaurant, which has only been in business for six months, does not serve alcoholic beverages. However, we noticed a few tables where guests had brought their own. I imagine there was a corkage fee. While we rarely go to Alameda, the trip from San Francisco was worth the drive. We will be back! Thank you for a lovely dining experience. Delicious food with good portion size, and a lovely warm atmosphere. Best veggie burger in Alameda. Very friendly, attentive service but not over-bearing. Hopefully they will get their liquor license soon, which will add to the overall great experience! Strongly recommend people try this neighborhood gem! Excellent brunch menu. It’s a new restaurant so the lines for Sunday brunch haven’t formed yet but they will. Food was pretty good, having no adult beverages was pretty disappointing. The serving portions were very large for us . Tasty and filling . Lots to take home . Wait staff very attentive. Worth a visit . We shared a caesar salad and our friends the beet salad. Both very tasty and generous portions. between us we had the scallop risotto, salmon, and both prawn dishes. All very delicious. We brought our own wine. Service was very attentive. We all said that we would definitely come back again. Our second visit. First one was spectacular. This one was just ok. Caesar salad not cold. Food items delivered out of sequence. Multiple requests for service items. Need more waiters to adequately serve the patrons. We’ll try it again. We enjoyed several delicious items from the menu. The pork bites were outstanding! The seared scallops risotto a taste treat! Excellent! Best value for the price in town. Bring your own wine due to no liquor license yet. I’ll be returning soon. Exceptional haute cuisine at everyday prices. CK is in the process of getting its liquor license so "it's bring your own bottle." For surprised diners, the wait staff suggests that they walk across the street to the corner store, buy a bottle of wine, and come back. They hold their table while they do so. We knew this in advance, so we came armed with a bottle of Charles Krug Generations. We started off by being served warm bread and whipped butter. There is a nice assortment of appetizers to choose from. We had the Lentil Cakes instead. The Lentil Cakes had celery, onions, carrots, flaxseed, chickpeas, and a cucumber yogurt sauce. My wife liked them better than I did. The flavor was OK, but they could have used more sauce. They were a little dry and crumbled as we moved them from the serving tray to our plates. My wife had the Inside Out Wagyu Oaxaca Burger. Wagyu beef is meat from Japanese Wagyu cattle that is known worldwide for its marbling characteristics and naturally enhanced flavor, tenderness, and juiciness. The burger is served with Serrano aioli spread on the bun and Oaxacan cheese inside the patty. My wife asked for it medium-well, but our server noted that since the cheese is inside, if it is cooked that much, the cheese might gush out. So she suggested medium-plus, and that worked out well. My wife substituted sweet potato fries for the garlic fries. The burger and the fries were excellent. Our server told us that the Seared Scallop Risotto was the chef's favorite, so I had that. It's a three cheese risotto with blood orange beurre blanc. The dish was excellent. The risotto was moist but not mushy. The prawns were not overcooked. The orange was a nice complement to both. A little beurre blanc probably goes a long way, but it was so good that I would not have complained had they smothered the dish with it. We finished off with a three-layer chocolate, vanilla, and Amaretto crumb dessert that was so good, we recommended it to other patrons who were beginning their dining as we left.